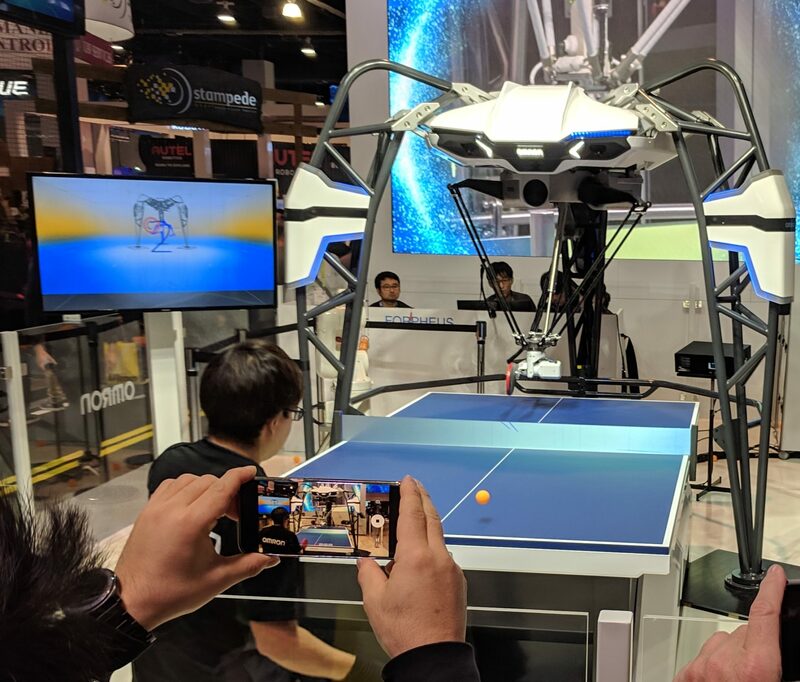 In no particular order, we’ll start with a repeat from 2018 – the Omron ping pong robot. The robot is displaying its skills in optical capability and arm movement. Its a pretty impressive display, b ut the human is able to easily beat it and I can tell the human is better than me, but not really a great player. Still it is a pretty impressive display and the rest of the Omron booth is showing how this kind of technology is applied to manufacturing lines. Next up is the Cruzr robot from UBTech. 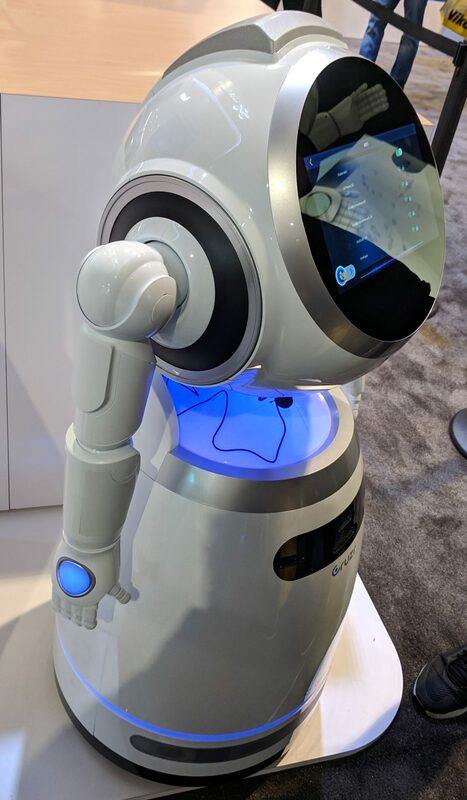 This robot is kinda clunky looking. 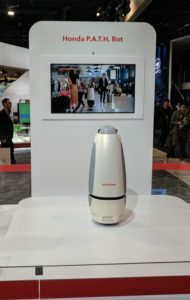 it is essentially an information droid meant for retail settings. 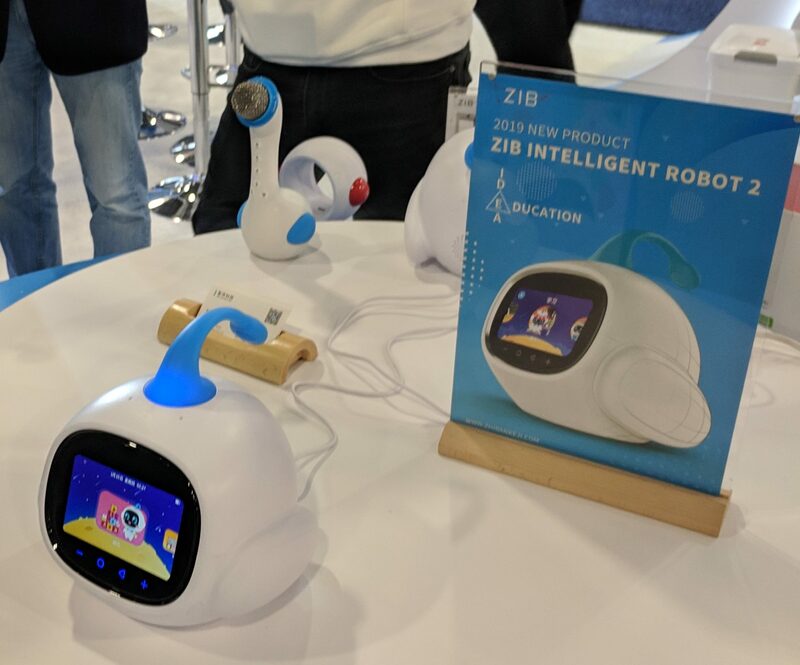 The Cruzr concept: You enter a store, use its touch screen to locate a product, it follows you and answers the questions that you have. Could be useful in large stores like Home Depot or Wegmans, but I watched several people try to use the interface with frustrating failure. UBTech had another “walking” robot – you can see pics of that one here. Another “companion” robot for kids, I’m not sure whether this robot is cool or if it is not a good thing. Its meant to fill the gaps when a child has no parent, guardian, or sibling to answer a question or have a conversation. 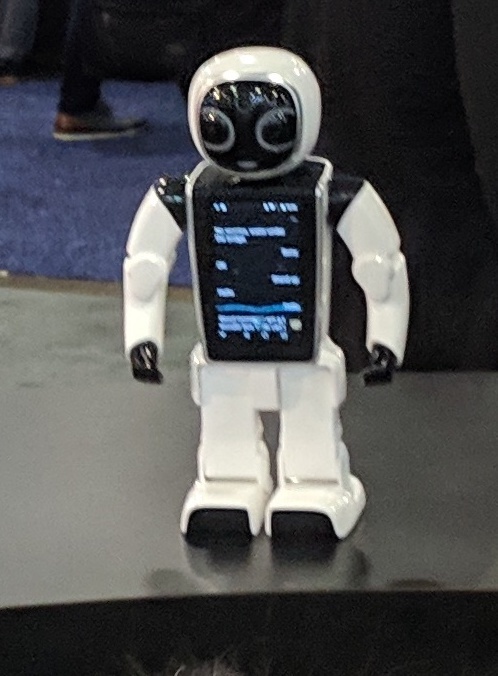 That’s sad, but the robot does work as advertised. Excellent speech recognition and a sizable knowledge base. GT Wonder Boy is basically a crude C3PO robot. It can translate into 13 languages, “educate” you are certain topics, be a general companion/PITA like the Star Wars droid. There were a lot of robots like this, really toys at this point in my view. Also quite expensive – this one at nearly $2,000 retail! Its quite small – maybe 12-14″ tall. Sorry for the crappy pic, you can get better pics on their website linked above. Next up – one for my son Ethan, who despite all my efforts at educating him about the importance of excellent lawn care, he adamantly declares that he will never mow a lawn. Good news! he won’t have to and perhaps he can still have a great lawn with this lawn moving robot from Shanghai Seven Bridges Robotics! 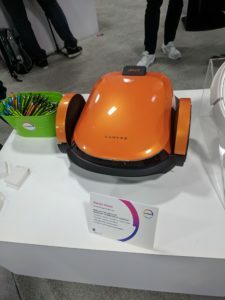 Actually the display is touting the 3D-printed casework, but lawn robots are coming. 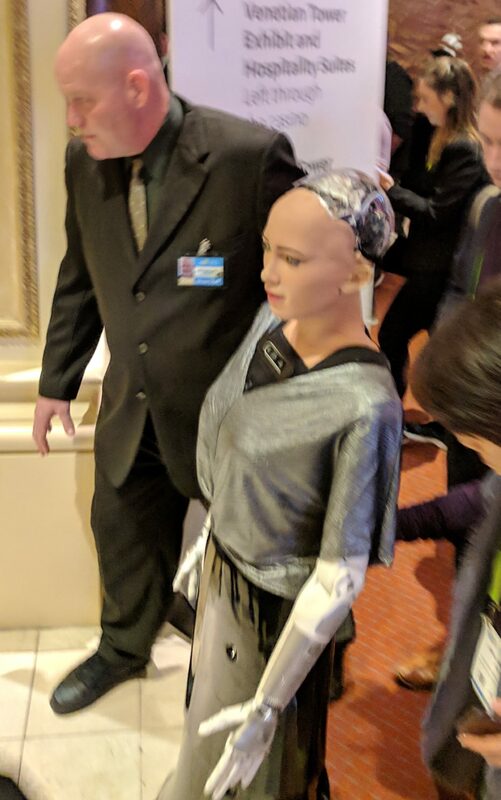 Finally we had Sofia, a robot meant to look human that debuted in 2018. I ran into Sofia as she was shuffling down the hallway from the Sands to the Venetian. She did look human-ish, her eyes moved, and her head swiveled, but I didn’t notice any actual facial expressions. Her body was also fairly ridig when moving, not like a human would move at all. She was heavily guarded so that the general public was not actually allowed to interact with her. Finally, I will end with Honda’s impressive P.A.T.H. robot. There were impressive videos of this robot successfully navigating crowds of people and obstacles. Since it was stationary at the venue I made some wise cracks about if it were so great why was it not wandering the Honda venue. 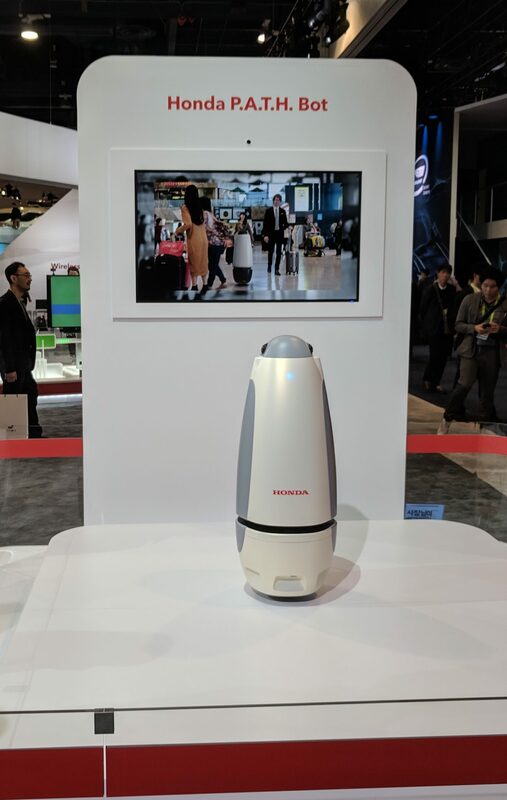 I guess the Honda rep heard me and came over and showed how if she stuck her hand close to the robot it would sense it and move out of the way. It easily glided back and forth inside the area. Fairly impressive. It rides on a ball like the little yellow droid in the latest Star Wars movies.